​Read the memories shared at Sister Mary's funeral. 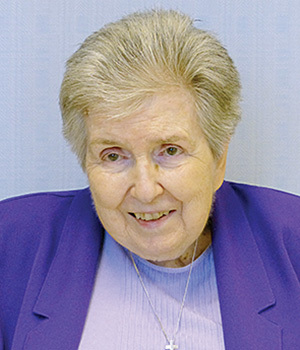 Word has been received of the death of Sister ​Mary Byrnes, CSC, who died at 9:40 p.m. on January 12, 2019, in Saint Mary's Convent, Notre Dame, Indiana. 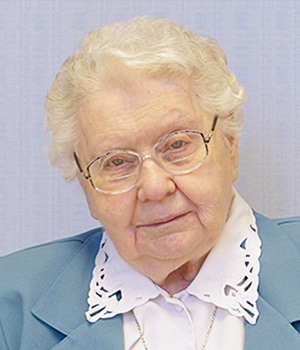 ​Sister Mary entered the Congregation from Logan, Utah, on January 28, 1946. 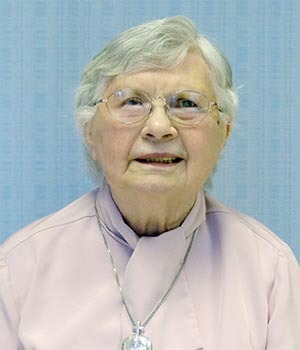 Her initial profession of vows took place on August 15, 1952. Please join us in prayer for Sister as we renew our faith in the resurrected Jesus and strengthen our hope that all the departed will be raised to eternal life. 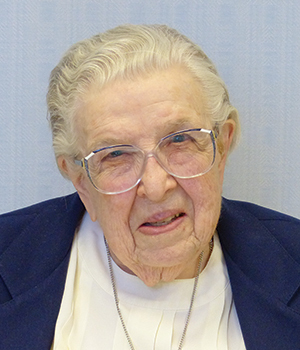 The holiness of Sister Mary Byrnes was practical, immediate and helpful throughout her life. Though she folded her hands in prayer, she also set her hands to do all that makes a house a home or an institution a community. Sister died at Saint Mary’s Convent, Notre Dame, Indiana, her home and community since June 2005. Violet Mary Byrnes was named for her mother Violet Mary Eliason, a woman who gave birth to 12 children, one having died at birth. The girls were named for flowers. Her younger sibling, Sister Viola Marie (Marigold Katherine Byrnes), was also a Sister of the Holy Cross and predeceased her on November 5, 2012. Their father, Michael Byrnes, was a devout Catholic raising his children in Logan, Utah, where The Church of Jesus Christ of Latter-day Saints predominated. In his efforts to support his family, he was described variously as a machine shop worker, laborer and beekeeper. The family has said their mother was a woman of tremendous faith, although she had no particular religion until she converted to Catholicism. Having grown-up in a large boarding house run by her parents, Mrs. Byrnes nurtured her children in a faith of good works, instilling in them the confidence to manage a household and care for the sick without the benefit of degrees in home economics, culinary arts or medicine. Mrs. Byrnes passed on her home remedies using nature’s gifts of honey, vinegar and olive oil. 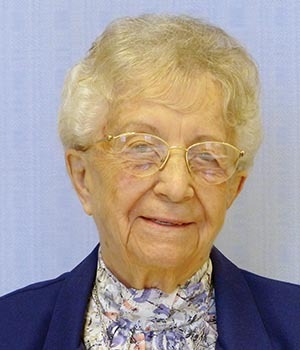 Violet Mary, the daughter, attended public schools in Utah, until her last two years of high school graduating from Saint Mary of the Wasatch in Salt Lake City where she was influenced by the Sisters of the Holy Cross and applied to the Congregation soon after graduation in 1946. 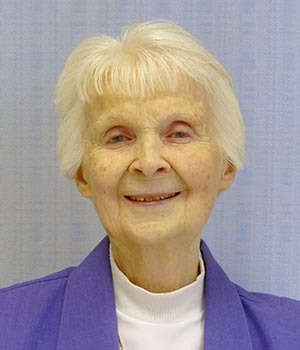 She was known as Sister Henry during her years as a teacher in Catholic elementary schools throughout California, from 1952 to 1968. She then returned to her baptismal name and kept only her middle name, Mary. 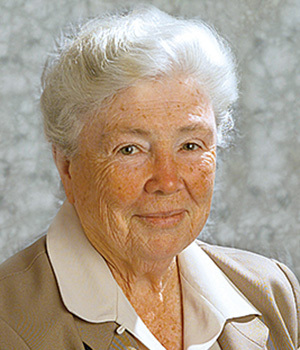 Sister Mary Byrnes was best known for her helping hand where she served in many ancillary roles. One of the Latin titles for the Blessed Mother in Catholic tradition has been Ancilla Domini, Handmaid of the Lord. 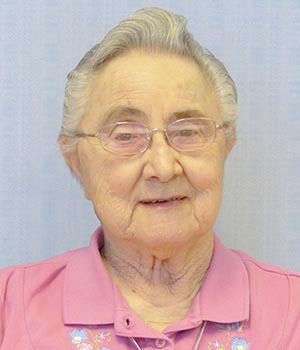 Sister Mary’s litany of practical roles in the community included: sacristan, housekeeper, infirmarian, driver, seamstress and office assistant. She especially enjoyed her time ministering with sisters and lay staff of Madonna Manor, Salinas, California, where she was a compassionate companion to elders in the facility sponsored by the California Catholic Daughters of America from 1995 to 2003. Sister Mary was also a gardener. In California, she won ribbons at the state fairs in Monterey County and later in Ventura when she was missioned at Saint Catherine by the Sea from 2003 to 2005. There Sister raised African violets and roses and sold her sweet peas to a local florist. 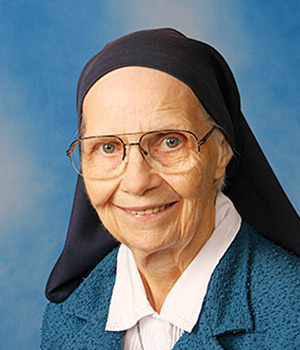 Due in part to Sister Mary, God’s beauty was found on earth and now in heaven. We invite you to donate to the Ministry with the Poor Fund in Sister’s name.